Telescope Planet and Procular are web shops that both include recommendations for beginners. 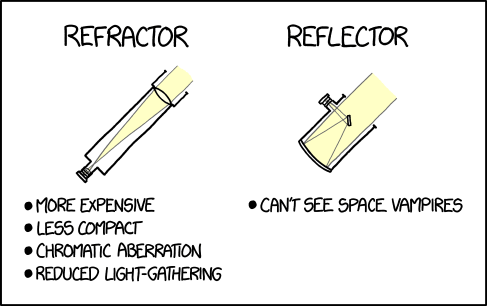 We're not associated with either of these, and a quick search for "best UK beginner telescope" will show many more! For anyone interested in the potential for amateur radio astronomy, a very interesting discussion of the possibilities is hosted by the British Astronomical Association. Stellarium is a free open source planetarium for your computer. It shows a realistic sky as you would see with the naked eye, binoculars or a telescope. Runs on Mac OS X, Linux and Windows. Virtual Moon Atlas used by more than 750 000 persons all over the world. Used in several books, magazines, observatories, universities, Web sites and blogs. Used in Chandrayaan 1 lunar mission preparation. Recommended by the European Space Agency (ESA) and the French Ministry of National Education. Available for Mac OS X, Linux and Windows. Celestia is free space simulation software that lets you explore our universe in three dimensions. Celestia runs on Windows, Linux, and Mac OS X.
NASA Jet Propulsion Laboratory - information on all NASA JPL unmanned missions. JPL also run The Theodore von Kármán Lecture Series every month. This page has information on upcoming lectures and an archive of previously shown webcasts. NASA Eclipse website - information on past and future solar and lunar eclipses, including the partial Solar Eclipse visible from Scotland on Friday 20th March 2015. Astronomy Picture of the Day (APOD) - Each day a different image or photograph of our fascinating universe is featured, along with a brief explanation written by a professional astronomer. Stargazers Lounge - popular amateur astronomy website, forum and source of information and advice. Space Weather - news and information about the Sun-Earth environment. NOAA / NWS Space Weather Prediction Center - the US government's official space weather site. The BBC The Sky at Night magazine website - astronomy news, equipment reviews and information. Members should login to see full events calendar.